It's no surprise where Peyton Manning ranks, but check out LeSean McCoy on the RB page. One thing you can use this plot for is to see which teams, players, and squads are likely to regress. for example. 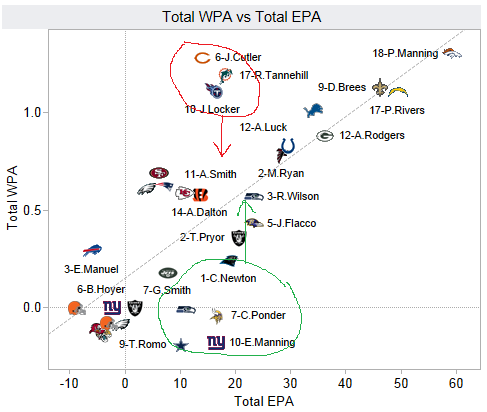 If you look at the QB chart, you can see that Cutler, Tannehill, and Locker have WPA numbers that far exceed what we'd expect given their EPA numbers. Recall that they each had game-stealing TD passes so far this season, inflating their WPA. It's likely that they'll return to earth over the course of the season and we'll see their respective logos drift down toward the trend line. *Guarantee not an actual guarantee. Looks like you lost part of your last sentence in the first paragraph. So disappointing to see Romo down there, especially since essentially all of his EPA comes from the Rams game. I don't know who's fault it is (play calling, residual pain from ribs, receivers not getting open, etc) but the Cowboys have simply stopped throwing deep this year and it's costing them points. It doesn't do much good to complete 70% of your passes and throw 0 interceptions if you never gain any yards in the process.